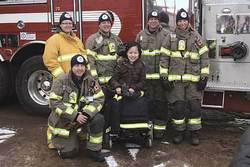 Feb. 14, 2013 12:00 p.m.
Helen Mah (young lady in wheelchair) never misses a year to show her support for the Leduc Firefighters On The Roof campaign. Helen (who suffers from MD) and her family are very thankful for the support they receive from the Muscular Dystrophy Association, which is made possible by campaigns such as this one. The five firefighters who made the roof of the Leduc Fire Hall their home for four freezing days have descended into the warmth of their loved one's arms, the congratulations of their brothers in arms, and the overwhelming gratitude of the many people who suffer from Muscular Dystrophy. Elated to be back on the ground and to have the prospect of a hot shower growing ever closer, the five also expressed how quickly those four days went by. Rooftop camper and Leduc Firefighter Kari Skierka said that it was such a great group up there, and they had so much fun, that they really could have stayed up even longer. With their compatriots at ground level striving to gather as many donations as they could and hit their $30,000.00 goal, it was a tiring four days but well worth it for all involved. Guest camper Jen MacKinnon from Clearwater County FD, even tried to give the donation boots a big boost by offering to shave her head for a donation of $5,000.00 on the last night up on the roof. When she came down with a full head of hair still firmly attached she was torn by the result. "I would have happily shaved my head if the donations had come through, but I am actually really happy to still have my hair." she confessed. "Besides," she laughed, "my husband probably would have killed me if I had come home bald!" One of the most anticipated moments of the entire four days was the arrival of Helen Mah. Helen is a young lady who suffers from MD, but despite being wheelchair bound, has made it to each of the rooftop campouts since they began in Leduc three years ago. She makes sure to arrive just in time to welcome the campers down. It is extremely motivational for the firefighters to see how well Helen is managing her disease, and to think that they might have had a small part to play in her experiencing a better quality of life with some of the funds they have raised. It is equally as touching for Helen's family, grandparents and all, that make the trip in to greet the campers every year, to know how much people care about Helen's well being. Leduc residents are known for their generosity and ability to back worthy causes, and judging by the bulging sports bags full of cash that were donated, it appeared that they certainly put their weight behind this fundraiser. A final tally of the amount raised is not expected until late this week, but one of the event organizers, Karen Faryna, guesstimated that they were extremely close to hitting their goal. If you follow the Pipestone Flyer on Twitter we will announce the final tally of funds raised as soon as it is announced. In the meantime, both Leduc and area firefighters and residents can rest easy in the knowledge that once again, they have come through for a group of very grateful people who will put these funds to extremely good use. Good job everyone!